Situated at the end of Marine drive, at the foot of Malabar, this vast stretch of sand and sea is the hub of human activity. During the day, the place gives a deserted look. But as the sun begins to fall below the horizon, the place starts getting filled with people from all walks of life. Every evening, this beach gets filled with people, amidst food kiosks, children screaming on ferry rides and pony rides, roadside astrologers making quick bucks, monkey shows and many more. Professional masseurs, snake charmers, gun shooting galleries make the evening even more bustling. The beach is famed for the immersion of Ganesh idols at the penultimate day of the Ganesh Chathurthi festival. Chowpatty Beach is an all time tourist attraction. 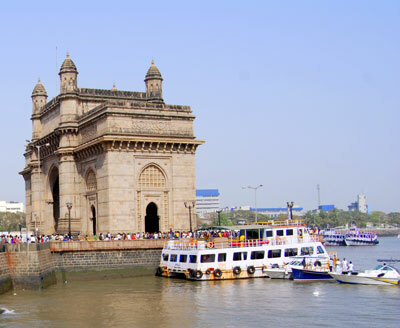 The grand and glorious landmark of Mumbai, the Gateway of India, is a huge archway located at the water edge at Apollo Bunder in South Mumbai. It was built to commemorate the visit of King George V and Queen Mary to India. It now serves as a testimonial to the foregone colonial British era. Mumbai hotels near Gateway of India. Another major tourist attraction is the Juhu beach. The Juhu beach is a beautiful beach spread across a stretch of 6km up north in Juhu-Ville Parle area of western suburbs of Mumbai. It is crowded by travellers, families and wooing couples who are there for a rejuvenating experience. An entertainment hub for children, it has become an extravaganza in presence of toy sellers, horse and donkey rides, dancing monkeys, acrobats and cricket matches. Not advisable for swimming and sun-bathing, it is a perfect place to enjoy the tasty Mumbai style street food, notably Pani Puri, bhelpuri, shevpuri and the tasty chaats. Shree Siddhivinayak Ganpati Mandir is the most popular & significant places of worship of Shree Ganesh in India. Situated in the Prabhadevi locality of the city, it is dedicated to Lord Ganesha, the Elephant God. It was originally built by Laxman Vithu and Deubai Patil on November 19, 1801. The temple witness’s exceptionally huge rush of devotees all round the year, especially during Angaraki and Sankashti Chaturti. Siddhivinayak temple is one of the most significant tourist attraction in India's religious tourism. Built in 1888 by the British, the Chhatrapati Shivaji Terminus is the busiest railway station in India, and serves both as a terminal for long distance trains terminating in Mumbai as well as the local trains plying on the routes of Mumbai Suburban Railway. It was declared as a World Heritage Site by the UNESCO on July 2, 2004Built in local sandstone, with a combination of the English Venetian Gothic style endorsed with elements of Indian Architecture.